Though it’s changed so much since Mr. Pilates first created it, The Pilates Method is still a comprehensive exercise and rehabilitation program. 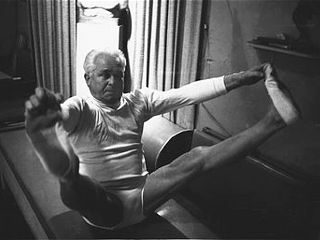 German born, Mr. Joseph H. Pilates designed his method early in the 20th century. Pilates and his wife, Clara, worked to develop and perfect this method of exercise training over a span of 60 years, creating a mind-body training that works to restore, invigorate, strengthen, educate and heal the body. Utilizing the Pilates equipment designed by Joseph Pilates, students are challenged to improve their alignment, coordination, circulation and balance while developing deep strength, increased flexibility and graceful movement patterns. Today the Pilates Method is widely practiced for both its rehabilitation and fitness benefits. The low impact nature of the Pilates workout, coupled with its emphasis on the quality of movement (rather than endless repetitions to the point of fatigue), makes Pilates perfect for any age, body type or fitness level. Members of the medical community increasingly recognize Pilates as one of the most successful ways to treat pain syndromes caused by spinal disorders, joint disease and injury. This entry was posted in Influences and tagged homepage. Bookmark the permalink.